In the last few years, augmented reality and retail have really come together, everything from billboard shops to products that come to life through your phone’s camera. Augmented reality has become the answer to the problem of an overcrowded retail landscape, consisting of consumers who have become desensitized to traditional marketing methods. These consumers are turning more and more towards a mix of online, mobile and bricks and mortar shopping. As such brands are being forced into concocting new ways to get attention. Augmented reality or AR can bring inanimate objects, images, labels, even shop windows to life. Consumers can experience brands and their products in a different way, engaging with them on a whole new level. It’s different, creative, somewhat unconventional and most importantly it appears to be working. The consumers are enjoying AR integration and big brands are noticing it, so here are some pretty key examples of augmented reality in retail. For London Fashion Week AW14, Topshop partnered up with Inition, to create a truly innovative virtual experience based around live streaming. Four fans, who won a seat on the virtual front row by sharing their London Fashion Week style on Instagram and Twitter, sat in the Oxford Circus store window wearing bespoke virtual reality headsets that played the fashion show live from the showspace at Tate Modern. The winners were able to see everything from the models walking past them to the Tate Modern ceiling to the celebrities virtually sat next to them. https://www.youtube.com/watch?v=lhcGI__SEAA Being a lad, I can’t say I’ve had too much trouble buying make up, however I’ve heard from a few sources over the years that it’s not as straight forward as you might have imagined. Apparently many women often struggle to find that right shade of hot pink or faded salmon. At the very least they need to know what it will look like before purchasing. Introducing Shisedio’s augmented reality mirror. It takes an image of the users face and then displays what the latest products will look like on that face. https://www.youtube.com/watch?v=vDNzTasuYEw It’s not new, but it’s one of my favourites and its probably one of the better uses of augmented reality in retail. One of the biggest issues when buying anything from IKEA is trying to work out a products size in relation to your own room, when your viewing it in an open plan warehouse that’s larger than terminal 1. I know they have those paper measuring tapes but they just never did it for me. So those clever lads over in IKEA’s marketing department solved this one as efficiently as their multi-function storage solutions. 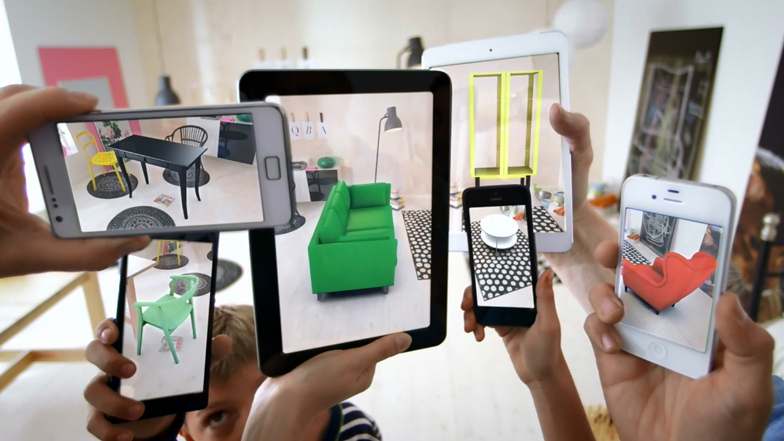 Introducing the IKEA AR catalogue. At last us mere mortals with our average ability for spatial reasoning, can see how well a piece of furniture will fit in our averagely sized home before purchasing it. It was and still is a serious game changer in furniture retailing.